...but obviously not blogging as much. A good friend reminded me today of why I love to blog so I'll get back on it- I have some things saved up that I've wanted to share with you (hint: Flinstones-sized rib eyes!) and I will do my best to keep on blogging about one of my greatest passions- FOOD! The photo above is one I took quickly after throwing together a plate of "healthier" homemade nachos. Nachos is something I rarely eat but crave often. 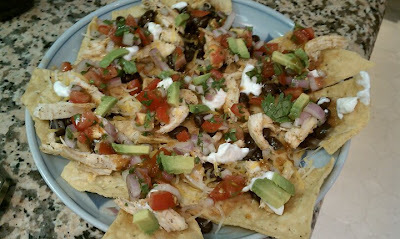 I'm not a fan of fast food nachos, but good, bar-food or fine dining nachos are awesome. I had some chips, so I topped them with shredded chicken, black beans, diced avocado, red onion, tomatoes, salsa & non-fat Greek yogurt (the best substitution for sour cream in ANY recipe, seriously!) and warmed it all up for just a minute before finishing it off with some fresh cilantro and green onions. It definitely hit the spot. 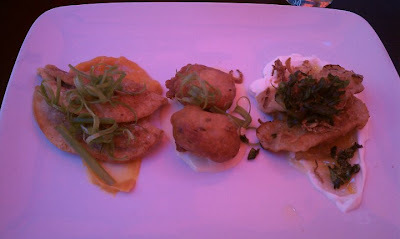 This photo of some dumplings I ate for lunch today at Susan Feniger's STREET came out oddly pink, but I think it was the tint of the reddish umbrella that shaded our table from the sun. This "Dumpling Sampler" consisted of Verenyk (Ukrainian dumplings filled with spinach and salty cheese served with sour cream and lemon marmalade), shrimp stuffed shiitake mushrooms and Mandoo vegetable dumplings which were my favorite, filled with Asian vegetables, sweet potato noodles and roasted honey yam and served with sesame dipping sauce. YUM! Hello, im from Dominican Republic and i was looking something to read when i found this magnific, amazing, tasty blog of yours! Seriously, i got hungry by just watching the food and wine and restaurants where u you go! I gotta say: i like your blog..
Hi Glen! Wow, thank you so very much. I haven't been blogging so much lately but your comment has really put a smile on my face and I will make sure to stay on my blog and keep updating. Where do you eat in your city? What are some of the best foods of the Dominican Republic?